I know a woman who used to live next door to some people she didn’t like. That was a very long time ago, but even to this day whenever those neighbors are mentioned, she says, in a haughty tone meant to mock them, “They thought they were better than everyone else,” and the irony of her statement escapes her. So today, ask yourself if there is someone who you think is not as good as you. Why do you think that? What do your negative thoughts about him/her say about you? As an exercise in understanding and forgiveness, try turning around your put down of the other person to make it be about you instead. (Using the example above, the statement would be, “I think I am better than everyone else.”) Consider that possibility, and if you have a strong visceral reaction to the inverted statement, that’s a good sign that you really need to consider this possibility and then work on it. In doing this, you will not only experience an opportunity to burn away a bit of your own imperfection, but you may also find that you have brought that other person into your heart. 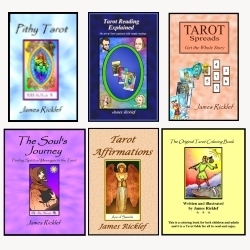 If you enjoy these words of spiritual advice from the cards, you will love my Tarot book called The Soul’s Journey: Finding Spiritual Messages in the Tarot.